They are made out of elastomeric rubber or thermoplastic materials like silicone, Teflon or Viton, and exhibit the same properties. Large O-Rings – Allied Metrics Seals & Fasteners, Inc.
Large O-rings are used in most process industries, specifically within the chemical, hydrocarbon, pharmaceutical, food processing, beverage and electronics industries. The multitude of applications for large o-rings includes thread tube fitting, which involves a third piece between two tubes that connects them, known as a union piece. This piece allows access for system check-ups and management of leaks and such. Fitting military gland designs, which are larger than most O-ring grooves, is also one example of how large o-rings are utilized. There is also the production of flat panel displays, which are built to support the weight of an object perpendicular to a wall. Such a display cannot shake or move and therefore requires the soft buffer of an o-ring between the wall and the mount part screwed into it. All of these applications require the use of a basic o-ring, except with a larger width, outside diameter and inside diameter, to support the proper magnitude of the product it is part of supporting. Large o-rings are usually rubber rather than metal, particularly in reference to the three applications just discussed. There are several different methods to determine the size of an O-ring or the desired size for a specific application. O-ring gauges are devices that measure the size of any O-ring by placing the O-ring being measured around two halves of spindles until it is a tight fit. The spindles expand until tight, and a size is sown in a digital window. Digital calipers perform a similar way, but measure the O-ring by a size chart. Shadow graphs match an O-ring with its correct standard sizing by providing life-size drawings of O-rings. All O-rings have standardized sizes among different countries, the most popular of which is the AS568 O-rings. Large o-rings are often sold as a part of an o-ring kit, with a variety of o-ring sizes packaged together by an o-ring manufacturer. For companies that have a multitude of products or systems requiring o-rings, a kit including all the sizes they need would be a smarter investment then buying each o-ring size individually. 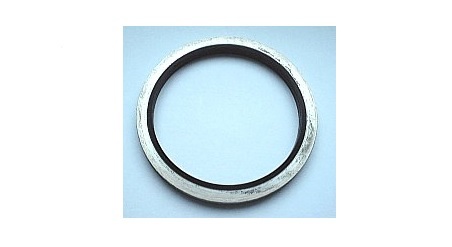 Large O-Rings Large O-rings are the most massive sized O-rings available for sale. Some are offered through sizing charts and mass produced, while others must be custom made to fit certain dimensions.